In one of his books Jerry Weinberg mentions a cleaner who wasn’t allowed to wipe the whiteboards. The story conjures familiar images of whiteboards full of stuff labeled “important - do not rub off”. It’s likely the stuff has lain untouched on that no-longer-white-whiteboard for weeks or months. It’s no longer important but there it stays, filling the whiteboard. 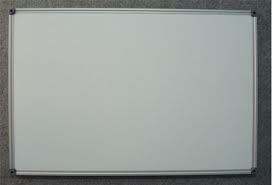 A whiteboard full of stuff discourages its use in exactly the same way an empty whiteboard encourages it. And a whiteboard with the words “important - do not rub off” positively discourages use. It's really saying "keep away". The whole purpose of whiteboards is that you wipe them. Perhaps they should be called wipeboards! Buying a wipeboard and its special pens and its special erasers and then filling it with stuff just the once is silly and expensive. If you want something permanent why not use a permanent pen on a big piece of paper stuck to the wall? Filling a wipeboard with stuff labeled “important - do not rub off” is also silly if the stuff genuinely is still important. Someone might be desperate for a wipeboard and decide their new definitely-important stuff is more important than somebody else’s existing possibly-important stuff. So they wipe it. Wipeboards are so easy to wipe after all! Le Chatelier's Principle says "[good] systems tend to oppose their own proper function". What is the proper function of a wipeboard? To be written on. How do you oppose being written on? Simple - wipe them completely clean every so often. Ruthlessly. Even if someone's written "important - do not rub off" on them. With this use-clean use-clean use-clean dynamic set up the wipeboards give a clear visual impression of their dynamic use since anything on a wipeboard must necessarily have be written fairly recently. If they remain mostly unused most of the time you get to see that very clearly too.